One of the largest exhibition in Canada. More than 40 model railroads on display. Over 30 vendors, new and flee market. 2019 edition relocated to Dorval Arena. Trains can be bought and sold at the show, which provides ideas and stimulates the creative mind. There will also be books, new and used, and videos for sale along with collectables and scenic materials to make mountains, trees and water and lots of free advice on how to create and enjoy your very own world in miniature. This show makes for happy children and grandparents with railways for children from 2 years to 100 years old. 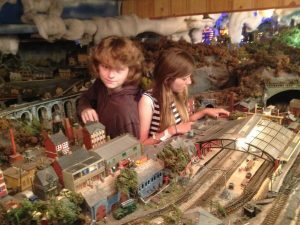 More than 40 model railroads will be on display, including Thomas the Tank Engine and Harry Potter, with all the bells and whistles to entertain, and show the artistry and availability of the world of model railways. Plus boats, plastic models etc. showing what can be made using one’s hands. And yes, they can be played with by the general public. 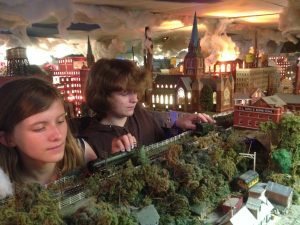 The Montreal Model Train Exposition is a miniature train show presented in conjunction with Sun Youth Organization, a non-profit organization renowned for its work in aiding the Montreal community. Sun Youth Organization is the largest independent charity in Montreal and is renowned for its integrity and ability to help those in need. Sun Youth Organization also enriches those who become involved with it. Not only is this show fun, but, as a fundraiser for Sun Youth Organization, it is of benefit to the society in general and those most in need. This show provides a flashback to the past and opens up old joys and experiences no longer common to today’s videogame generation, opening the eyes and minds of our youth to new possibilities and creative joys. The best time to visit the show is Sunday at 10 am. This show is a success due to the support of the media and clubs, and all help is greatly appreciated (contact Ivan Dow or Sun Youth. Please help publicize this show by sharing this page on Facebook.